Elizabeth was nearly eleven when her mother died. Her first appearance in the welfare records of NSW occurred on 6 October 1866, when she was placed in the Randwick Asylum by her father, a stonemason from Balmain.52 From Randwick she was apprenticed to Mr COULDERY of Parramatta on 2 March 1869. This service may have also been transferred to Mr LOUBEN[?] of Lane Cove but no dates accompany this notation in the record. About 18 January 1871, Elizabeth was in company with a Guaima, the wife of Yuma NURSERY, 'a coloured individual,'53 when they were arrested54 by senior-constable SAMUEL of Ryde Police55 for theft from both from Rose and Emily STORKER and also from Charles Maxwell HEPBURN. For one theft Elizabeth was summarily dealt with and sent to Darlinghurst gaol for four months56 and in a later appearance at Parramatta QS on 17 February 1871, she was charged with the theft from Charles H. HEPBURN. The date of Elizabeth's admission to Newcastle is difficult to identify. It is known that she spent some time in Darlinghurst as, in a letter written on 20 February by the sherriff at Darlinghurst Gaol to the Acting Inspector of Prisons which was forwarded to the Colonial Secretary, the sheriff questions what he should do with Elizabeth and the correspondence suggests that she was to be released from Darlinghurst after the date of the transfer to Biloela. In accordance with the writ of Habeas Corpus received her on the 17th instance, Elizabeth Randall, therein named was sent to Parra there convicted of larceny before the court of Quarter Sessions and returned to my custody with the following endorsement on the writ. "Sentence passed on Elizabeth Randall at Parramatta Quarter Sessions by Mr Chairman Simpson on 17th February 1871. Imprisonment in Darlinghurst gaol for two days to commence on 1st May 1871 and at the expiration of those two days to be sent to such reformatory school as the Colonial Secretary may direct and there to be detained for one year. The August 1874 list of Reformatory girls, indicates however that Elizabeth was admitted to Newcastle. The list records her separately from the other reformatory girls. While the others were recorded as having been admitted under the 'Act 30 Victoria No. 4', Elizabeth was admitted under 'any other Act.' This letter indicates that she was to have two days to gaol and one year at the reformatory and her gaol sentence was remitted upon her admission to Newcastle.57 No personal information can be confirmed from any reformatory records as they are not extant. Elizabeth married Louis or Lewis NORMAN69 on 16 January 1875, in the Church of England Church, Carcoar. The witnesses were Jane and Ann YOUNG. No parents or ages appear on the registration however the Carcoar church record indicates that Louis was a twenty-seven-year-old widower who stated that he had been born in Goulburn. Elizabeth was recorded as a twenty-two-year-old spinster who had been born in Sydney. Both were residents of Tuena. The minister was J. CLOUDESLEY BETTS. No parents were recorded in the church record but additional information that was provided was that Elizabeth's father was a stonemason.70 Louis was described in the Goulburn papers as a Chinese Christian71 who often worked as an interpreter in the Goulburn courts. By late June 1892, only one of Elizabeth's children – almost without any doubt, Ada – was living with her.77 Two of her sons, named in their court appearance as twelve year-old William and seven year-old Ernest, were sent to the Vernon in 1888.78 The Vernon records verify the name of their step-father and indicate that at the time of their arrest Elizabeth, and possibly also Tommy, had earlier been arrested independently of their arrest. Elizabeth's daughter was admitted to Parramatta Industrial School on 15 March 1892, as Annie NORMAN or HONG. The charge placing her there was living with common prostitutes but an earlier assault by a Chinaman, Lip WON, on her had occurred.79 Her birthdate of 4 May 1883, was confirmed in the register. Newspaper reports indicate that Annie, who was almost certainly registered as Elizabeth, may have been older than this, suggesting a year of birth of about 1879,80 but it is likely that even their mother was uncertain of the ages of her children. 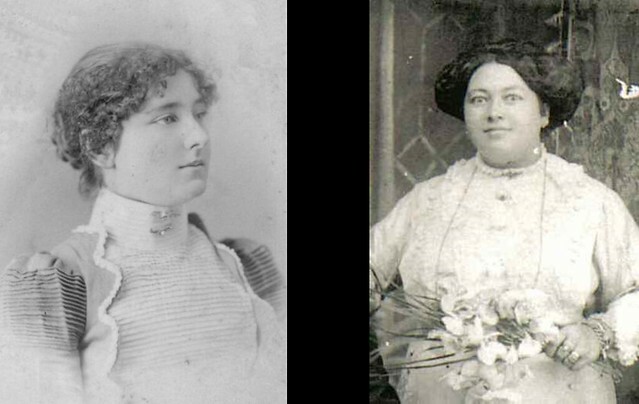 Annie's sister, Mabel May HONG or NORMAN was admitted to the Shaftesbury Reformatory at Watson's Bay for larceny for three years on 23 June 1892.81 The location in 1892 of Elizabeth's oldest two children, William and Eliza, is unknown. The fate of Eliza NORMAN is uncertain and the following story of her dreadful fate is accepted by Elizabeth's descendants but is unable to be verified. On 25 October 1909, at All Saints Church, Hunters Hill, Sydney, Elizabeth (X) RANDALL married Thomas (X) MOOR or MOORE. The record confirms that she had been born in Gladesville and that he had been born in Newcastle on Tyne. Both were residents of Hunter's Hill and Elizabeth's deceased parents were recorded on the registration as Joseph RANDALL, quarryman, and Eliza. Elizabeth was recorded as a widow in this marriage which was undertaken under her maiden name. Even though her age on the registration appears to be 65, it is thought that the unclear writing, records an age of 55 and actually indicates that she was born in 1854 and not ten years earlier. Thomas was fifty-five and his parents were recorded as Thomas MOOR and Euphoebe GUTTLEY. Elizabeth RANDALL's descendants have generously provided details of the family recollections of Elizabeth's daughter, Annie, and granddaughter, Leila, that add detail to her later life. Leila remembered Granny Moore and Tommy as being heavy drinkers. Annie used to drag her mother out of the local hotel and wash and clean and put to bed when she had too much beer to drink. Leila was told that Granny Moore was uncontrollable as a child and was beaten by her father Joe Randall. She was remembered by her grandchildren as a person who laughed a lot. Leila remembered Tommy Moore as being a nice person who had one short leg. The couple had five children – Joseph, John, William, Elizabeth and another daughter. Elizabeth's two older brothers, Joseph and John, were baptised before her birth and Joseph RANDALL's death registration confirms that the William RANDALL living in the Ryde area was also an older brother.96 Elizabeth was born on 20 July 1854, and was baptised on 26 November 1854, by George E. TURNER of the Hunter's Hill, Church of England, County Cumberland. Her father was recorded as Joseph RANDALL, a mason of Hunter's Hill, and her mother was recorded as Elizabeth. The NSW BDM index record of her baptism is erroneously transcribed and appears to indicate that Elizabeth was born ten years later in 1864 but the record itself records a year of 1854.97 It may be that the Bridget BRAMBLE, the mother to the William BRAMBLE who was born in 186498 was a sister. The Randwick Asylum records indicate that this child was admitted as William RANDALL and he was the illegitimate child of Bridget RANDALL. Bridget's connection to this family is still being investigated. Elizabeth RANDALL, Joseph's wife, was arrested for obscene language in Ryde in both September 186499 and July 1865. Court reports for her July appearance link her to Joseph and for this event both Joseph and Elizabeth were fined or were to spend time in Parramatta Gaol.100 No Parramatta gaol records for this time have been found so it is unknown whether they are missing or whether the fine was paid. Elizabeth RANDALL died at Ryde in 1866 when her daughter was only about eleven. Joseph was almost without doubt the man who was tried for the murder of his defacto, Mary POTTER, in Gladesville on 22 July 1868.101 He was found not guilty as it was ruled that POTTER had fallen into a fire in a state of intoxication and, as RANDALL was also drunk, he was unaware of her accident. His admission to Darlinghurst gaol was probably for this incident. The gaol records show that he was Protestant. Joseph RANDALL died at Hunter’s Hill at the age of 75. The Joseph RANDALL who died in 1932 at the age of 84 was Elizabeth's brother as his parents on the registration agree with those of Elizabeth. The Joseph RANDALL who married102 Annabella FERGUSON in Ryde in 1890 was this man's son103 and the Mrs Alice Jane RUST, from whose house his funeral left, was his daughter.104 Elizabeth's daughters are linked to Joseph RANDALL junior in Funeral Notices and In Memoriam notices. Three were submitted by Annie DODDS and Mabel NORMAN, Elizabeth's daughters, connecting them to Mary Ellen RANDALL, Elizabeth's sister-in-law, Joseph's wife. It seems likely that Mary Ellen was involved in the care of some of Elizabeth's children. 34. Could this boy be Frederick? 53. Editor's Note: This is the language used in the record.